When it comes to domesticated pet ferrets (not to be confused with wild European polecats or North American black-footed ferrets), there is actually only one breed—despite some being referred to as Angora, European, or Standard breeds. 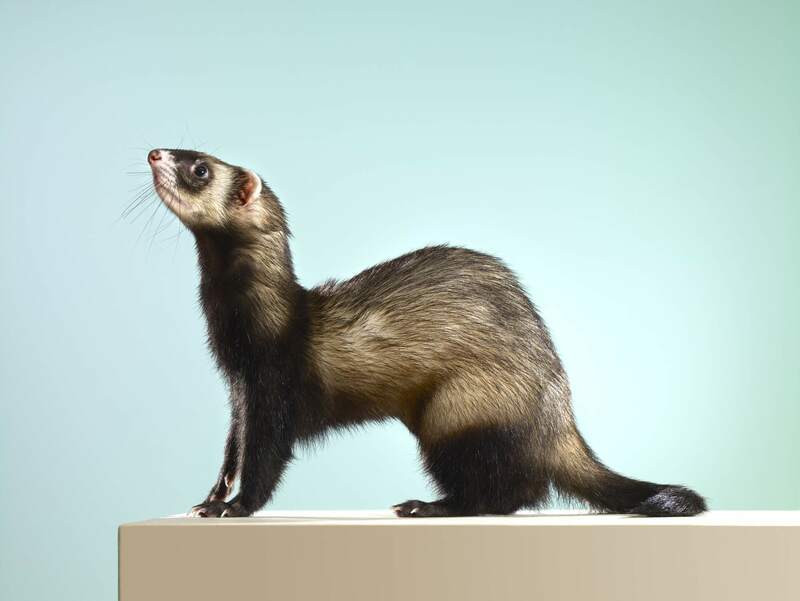 Part of the weasel family, the Latin name for the ferrets we care for as pets is Mustela putorius furo, but pet ferrets can vary somewhat in size and come in a variety of different fur colors, lengths, and patterns. The different colors and patterns that ferrets come in can all be identified by different names defined by the American Ferret Association. The AFA identifies seven different colors and seven different patterns that are considered breed standards for ferrets. There are also several descriptive terms commonly used in identifying ferrets, including self-explanatory mitts (feet/mittens), bibs (under the chin), and masks (facial markings). Sable ferrets are the most commonly seen ferrets. This typical brown ferret can be easily found in pet stores around the country. The guard or top layer of hair is a rich brown and the undercoat is lighter in color varying from cream to white and even gold. Slightly different than a regular sable, a black sable ferret has darker guard hairs and a cream or white undercoat. There is a more striking difference between the blackish-brown guard hairs and the lighter undercoat. The chocolate ferret has a milk chocolate appearance to its guard hairs with a white undercoat. The eyes are dark but the nose can vary in color from pink to brown. While not technically an AFA color, cinnamon ferrets have a lighter brown to reddish color and are not very common. The undercoat of a cinnamon is white to golden and the nose color can vary from beige to pink to brick red. Often referred to as a diluted chocolate color, champagne ferrets have lighter guard hairs and white to cream undercoats. Their eyes are usually light but can be a darker reddish color. Darker than the black sable, a true black ferret has black guard hairs and a white undercoat. It will also have black eyes and a black nose, although sometimes the nose can be spotted. A true albino is a white to cream ferret with red or pink eyes and a pink nose. 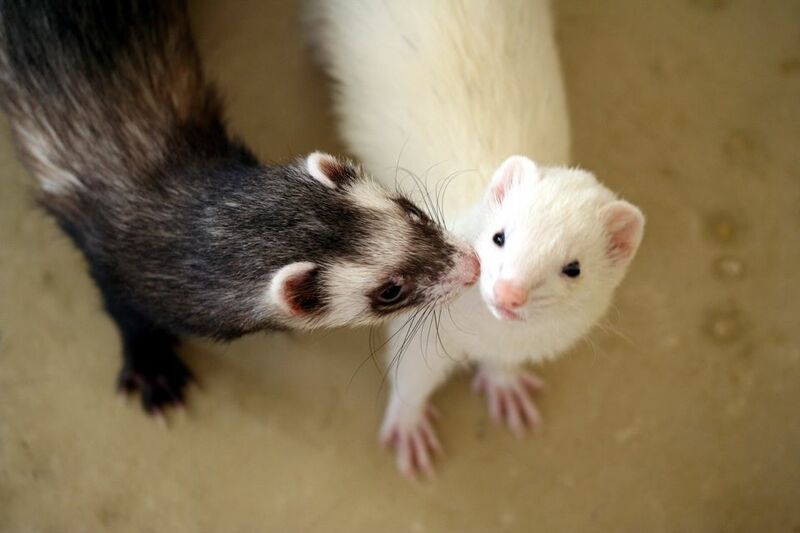 White or cream ferrets that do not have these pink eyes and noses are not albinos. Slightly different than an albino ferret, a dark-eyed white or black-eyed white ferret also has white to cream fur, but has black or dark eyes. In addition to distinct colors, ferrets can also have different patterns. Standard pattern - Similar to the solid pattern, all of a ferret should be the same color, but lighter than a solid and with obvious points. Striped pattern - Also known as patterned, the striped pattern is not considered a true AFA pattern, but it consists of an almost all white ferret with about 10% of the guard hairs having darker colors. Usually it is seen as a white or cream ferret with a stripe of brown down the back. Roan pattern - This pattern means that about half of the guard hairs are white and the other half are the color of the ferret. All colors of ferrets can have roan patterns except white ferrets. Point pattern - Also referred to as color point or Siamese, there is a distinct difference in color saturation or the color on the legs, feet, tail, shoulders, and face in point patterned ferrets. This pattern can occur in any color except white and looks like a classic Siamese cat coloring. Mutt pattern - The mutt pattern can contain a variety of colors and have roanings, spots, and other patterns. This pattern is a bit of a catch all for ferrets that have multiple colors or patterns. Blaze pattern - A blaze pattern can be any color except white and is a streak of color running from the back of the head down the neck. Blaze ferrets have dark red or brown eyes, the nose is pinkish, and white tips to the tail, feet, and knees are usually present. Other variations also exist with a white bib, spotted bellies, and some occasional white guard furs. Solid pattern - As the name implies, a solid pattern should be a completely solid color. Any color except white can have a solid pattern. Panda pattern - The panda pattern looks a lot like it sounds. Much like a panda bear, a panda patterned ferret has a contrasting head and body color. Darker colors are found around the hips and shoulders and mitts are present on the feet and sometimes the tail. Occasionally panda ferrets also have small color rings around their eyes.